The galvanised wire hoops are built into the cover, and the tunnels fold away concertina-style for easy storage. Drawstring feature enables open or closed ends for ventilation or maximum protection. Strong, white polypropylene fleece, to protect against frost (to -5°C), harsh weather, pests, but allows air, light and some water through. Standard Size 3m Tunnel: Length 3m (10'), Width 45cm (18"), Height 30cm (12"). 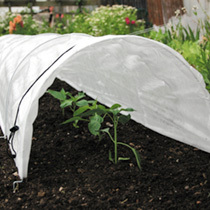 Protect rows of vegetables and fruit!